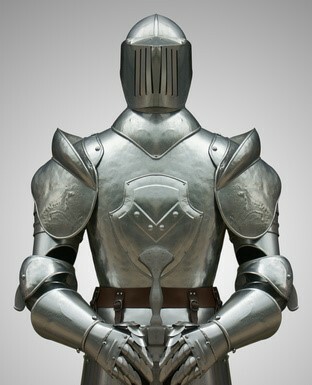 Companies often let one think of tremendous armours of the Middle Ages. Their imposing bearing, well-designed for combat with spears, metal parts polished, leather joints properly waxed. They are protecting the body of those inside … and yet lock them in… they are completely unfit for modern combat. Management also means knowing how to dismantle the shackles which impede organizations. The narrow steel visor plate prevents from seeing the world around. Rigidity and inflexibility prevent from evolving. The encased body is slowed down and modern soldiers get out of breath just by carrying this burden. A company armour has several elements: systems, structures, cultural features. Let us dissect the shield. First the structure: those elements that « structure” the patterns of thought, the « working together », the way decisions are made, the freedom of movement. They can physically or virtually lock individuals and communities. They include the architecture of offices, for example, by separating people or, on the contrary, by mixing them excessively; IT structures that do not tolerate access to social networks or to external tools, yet used by all, such as Dropbox or Skype; very strict hierarchical structures; minutely detailed job descriptions; lengthy skill frameworks, etc. that are determining de facto “boxes” articulated with each other, but increasingly out of synch with reality. Then, the systems, these elements, mainly the processes, which allow the organizations’ engines to run but which sometimes lead to counterproductive behaviour, often resulting in time-wasters. They can be found in all functions. The audit and controls are responsible for many of them. HR have spent the last twenty years creating many sophisticate ones, including recruitment, mobility, assessment, training… that are only striking examples of systems quickly becoming inadequate to the modern world as fast as they are designed because jobs, skills, positions, hierarchies become obsolete nearly by the day. The regulatory and legal dimensions are often at the origin of certain structures and processes, from labour laws to safety regulations, etc. but let’s not limit ourselves to regulations bashing. The very translation of regulatory items within the internal structures and systems seems to have excelled at complicating them even further and, ultimately at removing the trust in people for replacing it with trust in processes and rules. Finally, corporate culture: It determines social behaviour, attitudes, codes of conduct, that are more or less rigid and codified. It can be observed through seemingly minor signs, like having to wear a tie when you are an executive; or through profoundly structuring elements such as the values around punctuality, the acceptance or not of deviant or innovative behaviour, the attitude towards teleworking, the concrete ways to making decisions, the belief in a certain pattern for leadership, the right to dissent, solidarity in failure, the famous Not Invented Here syndrome, the refusal to rehire someone (the concept of the traitor when leaving the company), etc. Does that mean armours should be fully removed? Nay! For the body of the company would then be naked and defenceless. Not to propose a new holding and not arming the body to dress, to the use of new weapons, would be a serious mistake (let us not forget that armours protect as much as they enclose and lock the body, that we both love and hate the shield). Then, how do we make an armour agile or even turn it into a Jedi outfit? By working on some of its elements -instead of revolutionizing the whole thing, we may thus imagine deletions and partial replacements, gradually changing the whole yoke. You can act on the structure (such as IT), on certain systems (such as evaluation), on elements of culture (such as teleworking). Every function can perform a value analysis of a specific process, or structure, or of a cultural element, and sometimes delete them, or at the least, begin to tune them in with the outside, to listen and to invent more adapted ones. Pilots can be launched, i.e. experiments, which, here and there, in checked and tolerated universes, invent new combat-ware. Privateers may be approved by senior management with a mission to break such or such codes (i.e. projects, unconventional meetings, innovative cultural shocks, etc.). Pirates can be tolerated once their “crime” completed; such would be the case of unreported group-wide projects or budgets diverted to launch new initiatives, etc. Sometimes pirates can be transformed into privateers in order to continue their activities, for example when an internal crowd financing pirate scheme becomes an internal recognized crowdsourcing system. True tolerance to pirates however requires a cultural attitude that may need to be created. Any armour has its flaws, the identification of these faults is everyone’s business. Some companies have not yet abolished the tie and yet ties disappear in many offices. Many workers have realized that they can play with rules. There are always real degrees of freedom. Everyone can hack the armour in his/or her own way and within one’s means. Members of the executive team will have more power than middle managers or employees, for sure but this does not mean that the latter have no room for action. The advantage of hacking is to be progressive, only doing the organization little violence at a time, to progress by trial and errors and to become a proof of concept when one wants to generalize changes.